We’re absolutely blown away by the Diavel. It’s so light, fast and sophisticated, so good handling and fun, it completely turns on its head everything we thought so-called cruisers were about until now. 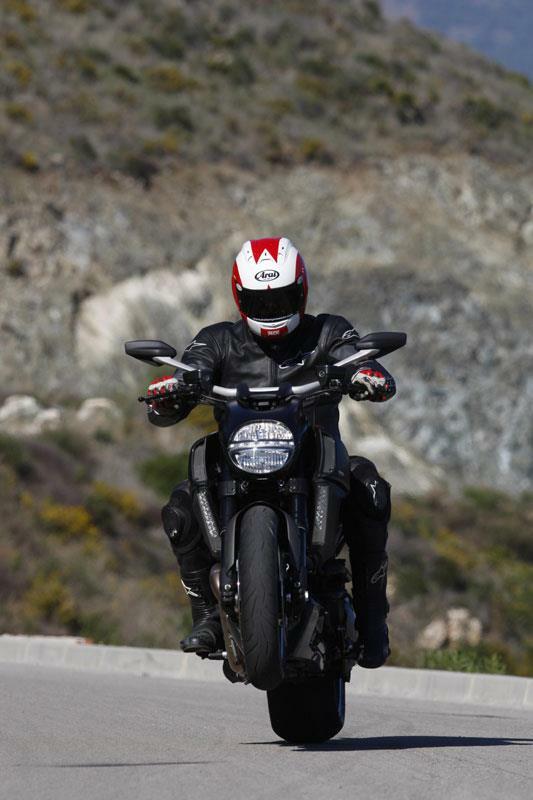 Or, to put it another way: the Diavel does to the cruiser bike class pretty much – if not more – what Ducati’s Multistrada did to the adventure bike class. It adds a degree of performance and sports ability to a class of bike where it simply didn’t exist before. 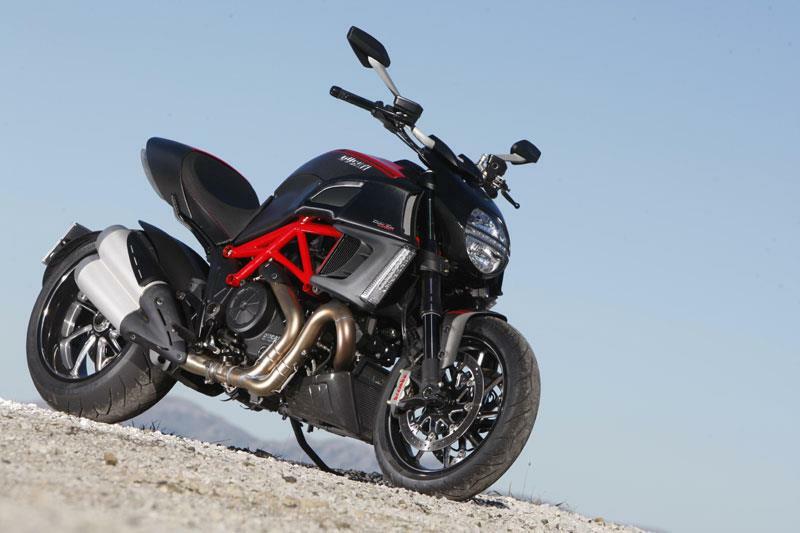 The Ducati Diavel impressed MCN so much when it was released in 2011 that it won our Machine of the Year award that year. MCN Editor at the time, Marc Potter was blown away when he rode it. He said: "There was no hesitation here because I've never known a bike exceed expectations by such a huge margin. It has massive presence as a cruiser and should clearly appeal in an entirely new market for Ducati, yet the performance is epic and the feel of the bike is fabulous." 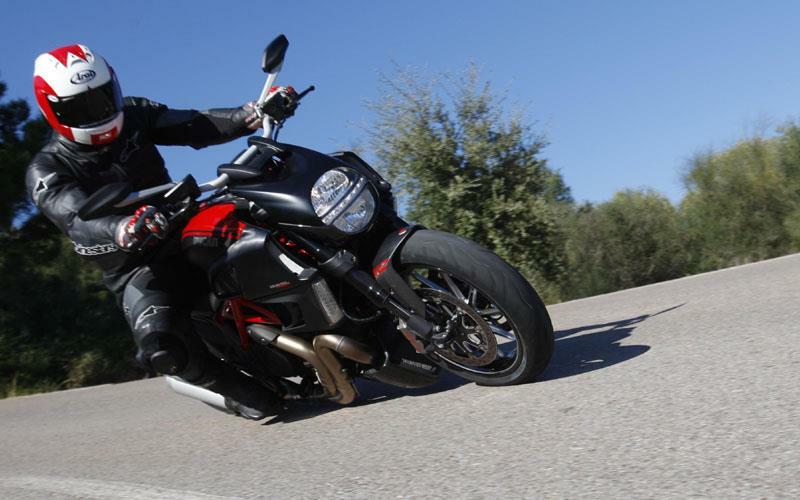 The Diavel fought off tough competition from the BMW K1600GT, the six-cylinder tourer that had just been released at the time to take the UK's most coveted motorcycle award. 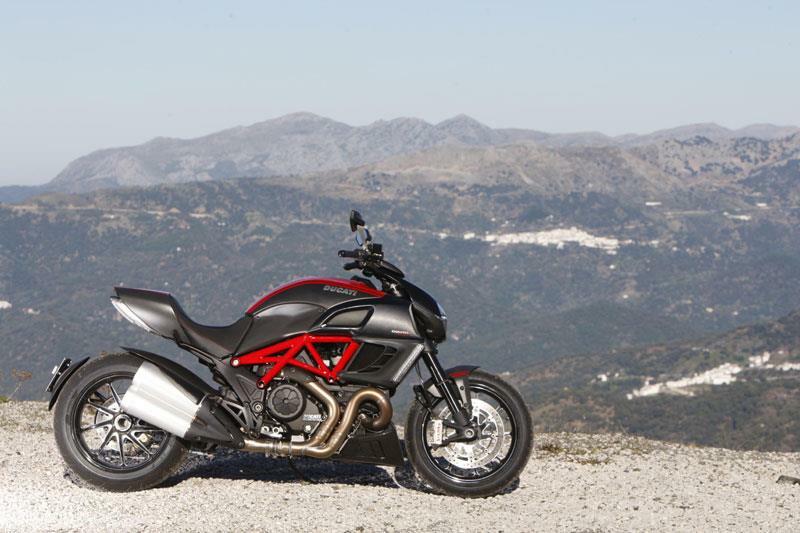 View all Ducati Diavel motorcycles. We can’t quite get our heads around how Ducati has managed it, considering the Diavel’s long, low cruiser gait and fat back tyre, but this bike steers and sweeps and scratches and stops almost – almost – as good as a super naked. It’s that good. It steers perfectly neutrally and holds its line without complaint or (amazingly) decking out – and boy we tried. Its ride is smooth and controlled and the brakes are simply awesome. 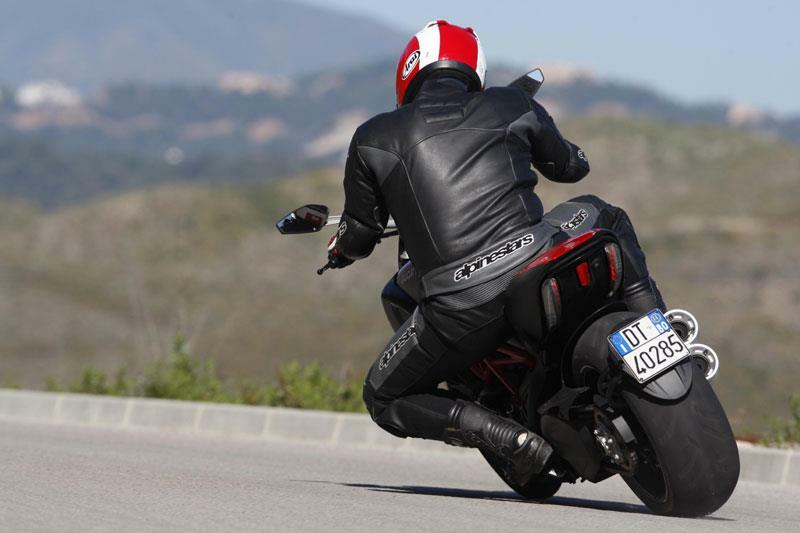 Sports bikes WILL be humbled by the Diavel. 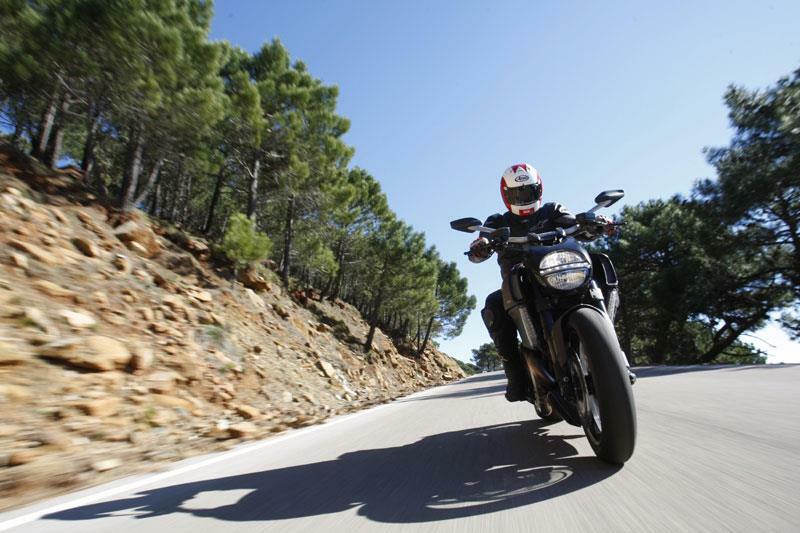 The ride can be further improved with the addition of an Ohlins suspension upgrade which is precisely what MCN did with its long term test Diavel. 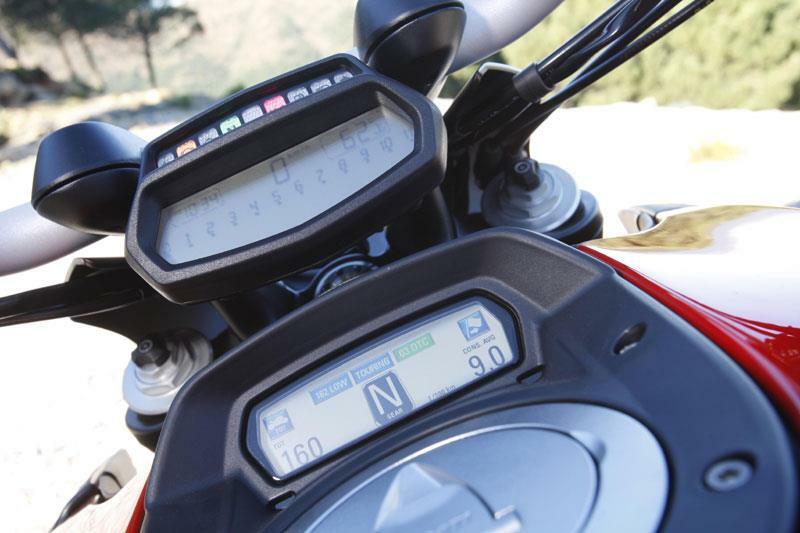 Testastretta 11º engine is essentially identical to that of the Multistrada 1200. Different exhaust and airbox, however, liberates 12 extra bhp to produce a peak bhp of 162, enough for it to be quicker even than the 1198 from 0-60mph. Fuelling and delivery is perfect, switchable riding modes (engine maps) allows a choice between Urban (100bhp), Touring (soft 162bhp) or Sports (sporty 162bhp) maps, making it not just fiendishly potent, but practical and versatile, too. The Diavel is good value, especially compared to its competition such as the Yamaha VMax and the Harley-Davidson V-Rod Muscle. You get an awful lot of tech, quality and style from Ducati and, best of all, performance that simply blows away anything else in the class. Diavel Carbon: Carbon fibre body panels and mudguard in unpainted black plus a black nitride coating on the forks and forged Marchesini wheels with matching, machined disc carriers – all of which trims weight by 3kg (the wheels alone are 2.5kg lighter). 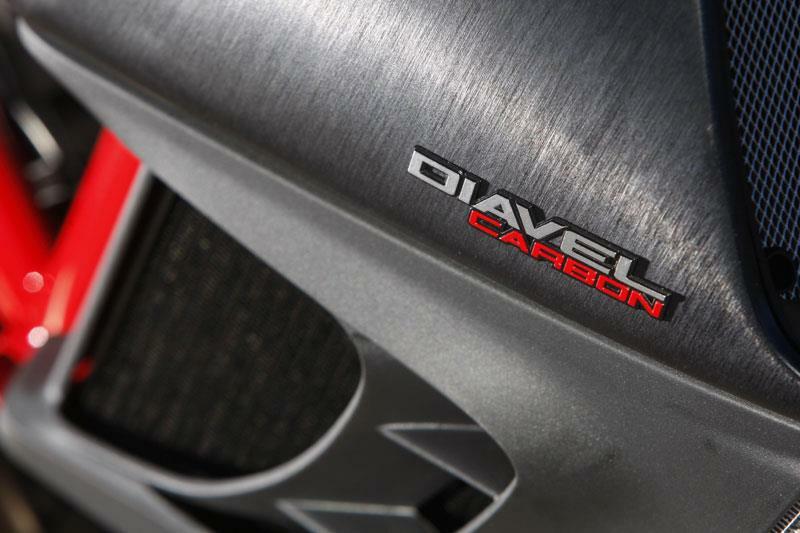 Diavel Carbon Red: As the Carbon but with red paintjob. 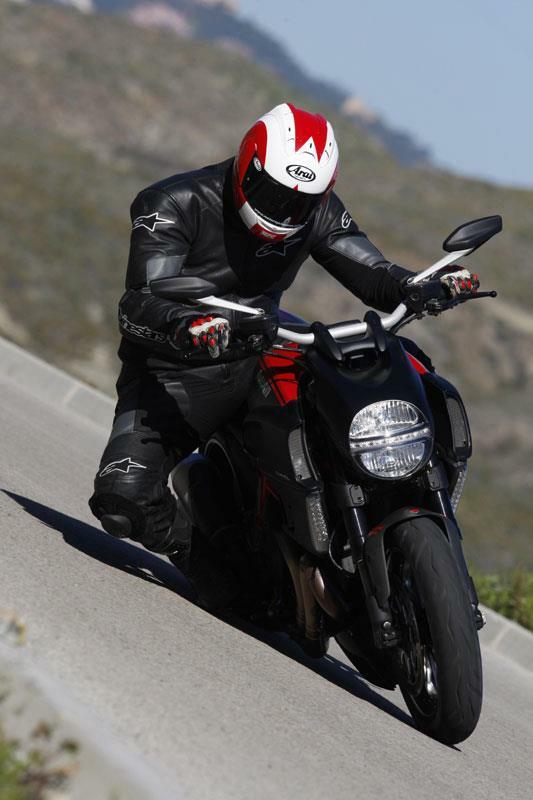 18 owners have reviewed their DUCATI DIAVEL (2011-on) and rated it in a number of areas. Read what they have to say and what they like and dislike about the bike below. This bike is the cutting edge of motorcycle technology, with 8 levels of ABS and traction control, 8 being the "rain" setting where maximum interference is required regarding wheel spin or skidding. 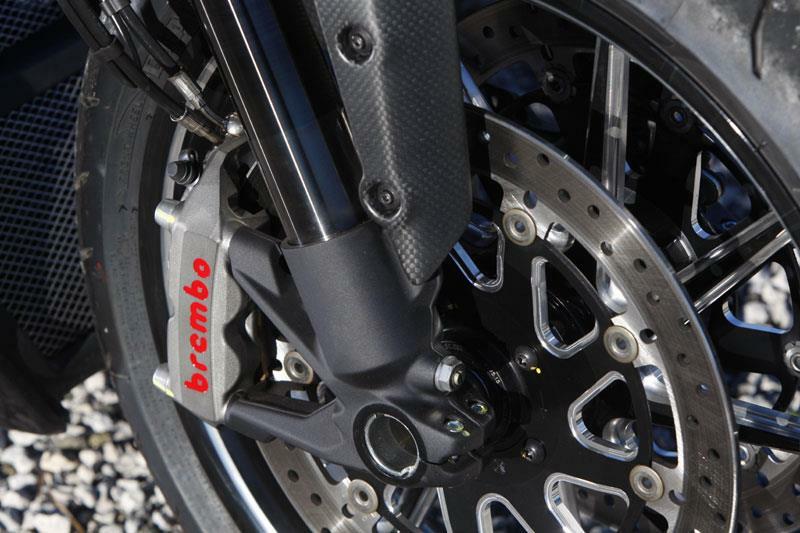 The ride quality is outstanding as are the Brembo brakes. The engines performance is tremendous, it has torque at all points and pulls like a locomotive fueled with nitro, in fact it took me months before I could go through the gears flat out, the engine "explodes" with power and simply gets stronger all the way up, by the time you are out of 2nd gear you are flying. The quality is unsurpassed,Ducati uses the finest components available, the fit and finish of the components are exquisite, my bike is mechanical art, I can look at it for hours. The valve adjustments take many hours which equates to approximately $1,500 and this is not including parts such as tires, brakes, chain, sprockets which wear faster than lesser performance machines. One thing I discovered is there are many barely used motors available online for the Diavel and they are selling for not much more than a tune up. I had a 1991 BMW 850 V 12 Coupe and it's engine was very similar in that if it required much repair the costs soon eclipse the cost to simply swap in a used motor with low mileage. The forums called it a "throw away motor" because if the water pump or cams failed it was cheaper to replace the motor rather than repair it. The bike is the closest thing to a Ferrari I have ever owned, it is more of a machine than I can use, it's capability surpasses my skills , thankfully the electronic aids allow me to ride the bike much more safely than a bike with this much HP and no electronic aids. There's no perfect bike, but this comes pretty close in many areas. It's darn good looks and the mighty engine retrieve most of its weaknesses. Diavel's raw twin engine is at it's best on curvy country roads and it's modern looks draw admiration on city boulevards. An ultimate blast to ride between 60-160 km/h (massive grunt and insane top end too). Below that the ride is a tad jerky and above that the lack of wind protection is obvious. Chassis and brakes are good. Sitting position and the ergos are comfortable, but handlebar vibrations become quickly irritating on longer journeys. Compared to inline-4s the engine feels rough and unrefined, but that's a vital part of Diavel's charisma. And so is the racy sound of it too. Raw power is available at any time and anywhere, which makes overtaking devilish fun. Quickshifter would double the fun though. It takes 240-280 kms for the Testastretta L2 to swallow a tankful of gas. Let's get this straight: Italians know the design! This bike really turns heads - so much you may even be tired of it. Reliability is good and quality quite wood as well. 1st Gen bike had certainly more small annoying flaws to be fixed. Service and insurance costs are generally higher than other bikes'. Rear tyres lasted about 9000 kms, but that's ok considering the huge torque of the L2 and the grip of a 240mm rubber. Standard equipment is pretty good with the riding modes, keyless start and so on. The dash looks damn good and has lots of info, but is situated too low below the field of view. Diavel is certainly not a bike for a pillion and the lack of stylish hard cases hurts its touring abilities too. 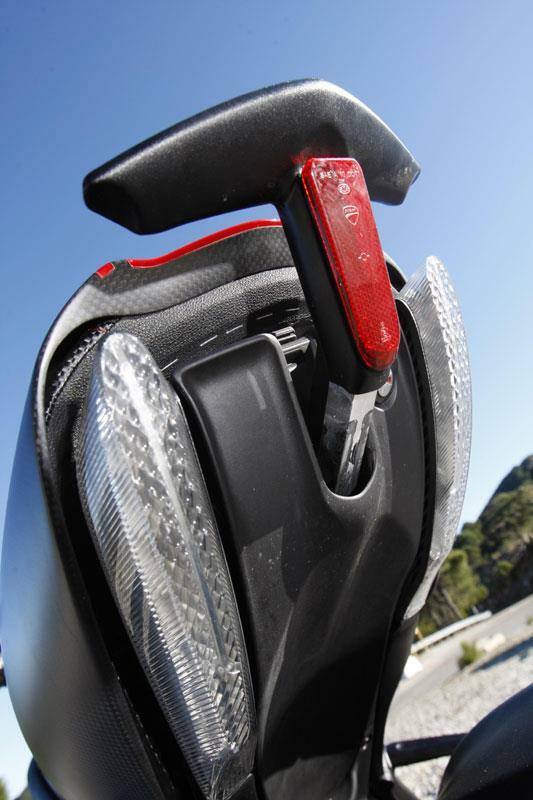 A cruise control would broaden the bikes' range of use. Loads of 'Stmo' and very good all round performance. Quite simply the most outstanding road bike you can buy. I challenge anyone to ride one and not be blown away and completely converted. This bike is accomplished at everything, has a huge amount of character, massive grin factor and turns heads wherever you go. Kids give you thumbs up, old boy Jaguar drivers wind down their windows and gawp, dogs bark or run in terror. Nothing else has this much presence. Goes like a stabbed rat, sounds like armageddon. Outstanding chassis, handles way better than it should. You can absolutely stuff this bike into corners with complete confidence, trail braking deep and late. It does a pretty decent impression of a much nimbler machine at a trackday, and will embarrass all but the very latest sports bikes. Massive rear end grip, steer with and feel with your bum (although you can make it slide for fun), M50 Brembo callipers are the best brakes you will ever feel on a road bike with no perceivable fade under really hard use and outrageous stopping power, ABS gives huge confidence in the wet. Easily adjustable rear preload. Bonkers ! Feels like you have pulled the pin on an Inter Contintental Ballistic Missile. Ridiculous giggles, and hours of fun monstering sports cars. I'm surprised it's legal. Cleans up really easily, no corrosion, pitting or signs of weather after 4 years. Fantastic build quality. I've been touring in Europe through Spain with no issues. Starts on the button, nothing has ever gone wrong apart from a loose ABS sensor cable - which attaches to the battery, and was fixed by tightening the bolt. 3 rider modes, TC (useful). Standard seat is a pain after 100 miles. Ducati GT replacement seat is lovely. We have fitted the Pannier set, for (very fast) touring, 2 x 35 litres, and well designed and made. The overall fit an finish on the bike is superb, and shows a real step up from Ducats of old. Bought privately, and immaculately presented and well cherished bike. Nice bike, on smoth roads. Very expence for the quality presented, lot of vibrations at low revs. Best thing about this bike is it puts a smile on your face.I have been riding very sensible bikes for a few years now, BMWs RTs but at 63 I needed a bit of fun. Smiling all the time so much fun. Obviously I took too long writing the review underneath! P.S: The mph figure mentioned should have read 100. Nice, but not the bike for me. Had the Diavel for two months and done 1000 miles and every one of them has been fun!!!!! Riding position is spot on for me (5'8) no aches or pains from the standard seat, only thing i changed is the exhaust to the Termagini full system fitted for £2500 and they sound amazing even though they are expensive. The power and speed of this bike is amazing and breathtaking it goes around corners as well. in my eyes 10 out of 10!!!! Great bike Great mag.  Seems your Mag is not posting my postings. Looks like were in censorship mode because i was criticle of your Biased testing. It sums up the Diaval, a smile on my face everytime I ride ... unless it's raining (don't like rain!). I'm just approaching the first 600 mile service and am blown away by this bike, the 3 riding modes are brilliant, the ride is very comfortable, have done 3 hours in the saddle without stopping. The noise .. oh the noise .. like a grizzly bear with toothache!! £13k is a lot but the kit on the bike is justified, the brakes are amazing. Can't wait now to take the rev's to the max .. in sport mode !! I'm at that age where riding with my arse in the air for too long requires the use of more drugs than should be legal to ride with. On the other hand at 50 I am still way too young for a Harley, and anyway there are too many tractors round here already. The Diavel is the perfect bike for me, most of the time. It’s comfortable enough to tour on, even with the poor tank range, but I haven’t worked out a luggage solution yet – but no doubt someone will soon. I have no idea how to program all the features, but the three default modes seem good enough to me. It handles way better than it has any right to with its length and rear tyre, and attracts comments wherever you park it. My head tells me I should have bought something more practical; my heart tells me it’s perfect. I guess that is the point, if you try and rationalise a Diavel it makes no sense, but it’s Italian, and you don’t buy Italian machinery with your head. It does mean I need to save up for something sensible for commuting and longer distance touring but I’ll buy that with my head, in the meantime the Diavel is the perfect Italian mistress. 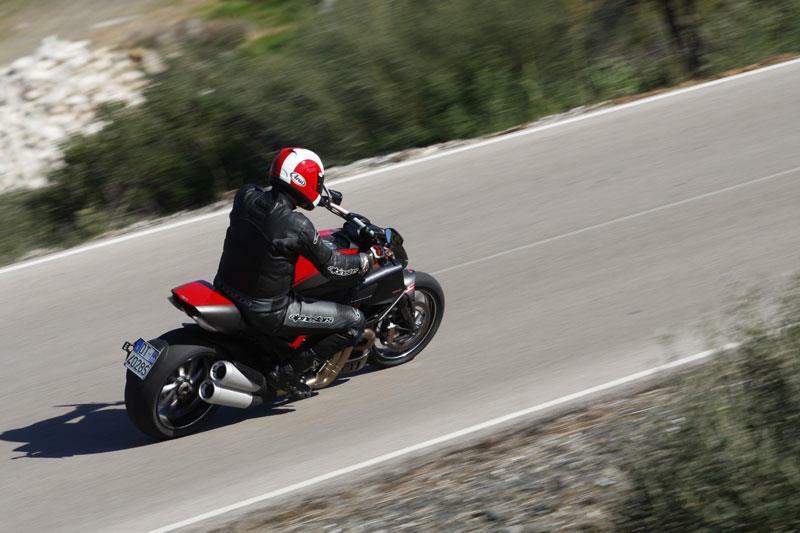 At last a Ducati you can ride some distance on and you can see pass your Elbows. Just had 1st 600ml service done and have enjoyed every mile. Just demo one, its Brill. Have had the new V. Max when it was 15000 Quid. A damned heavy bike. Plus 100klg. Thats why the Diavel will see one off plus out corner it. And you get lots of electrical goodies to play with. Will it Tour?? Am about to find out, Am off to Germany Swiss then Stelvio Pass Italy this Friday. Had a few probs finding suitable luggage. Tank bags a problem as it covers up the dam Instruments. Still will give it a try. So might change my opinion on return. Chow..